This is an article from London’s The Evening Standard of 30th August 2011. 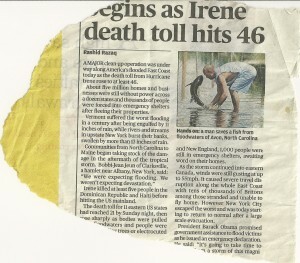 The headline reads Huge clean-up begins as Irene death toll hits 46. The article itself is unremarkable. What concerns us is the photograph and caption. We will all do unusual things in times of great stress and surviving a hurricane is going to lead to strange deeds by a lot of people. 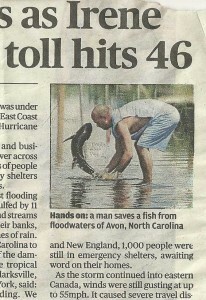 One of these deeds is, however, unlikely to be saving a fish from the water in which it is swimming. This is a man caught in an intimate moment with his partner. Normally, one presumes, their pleasure would be taken in privacy. But a hurricane destroys tree cover, removes the screening reeds and sedges by the riverside, erodes the inhibitions that normally lead to circumspection. This is a moment of passion, thrown into embarrassing relief by extraordinary circumstances. Well done to Rashid Razaq for attempting to preserve the man’s feelings in this international expose.